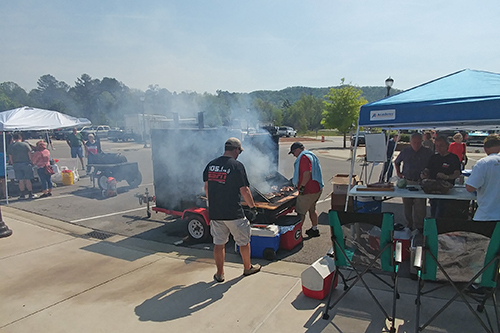 We had a great time at the Ooltewah BBQ Brawl last weekend. 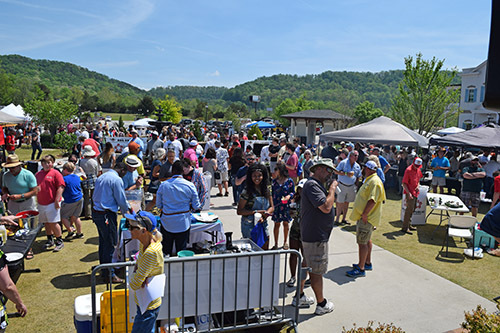 The weather was gorgeous, the aroma of 20 grills cooking filled the valley, and the crowds came out to experience it all. What a fun food festival! 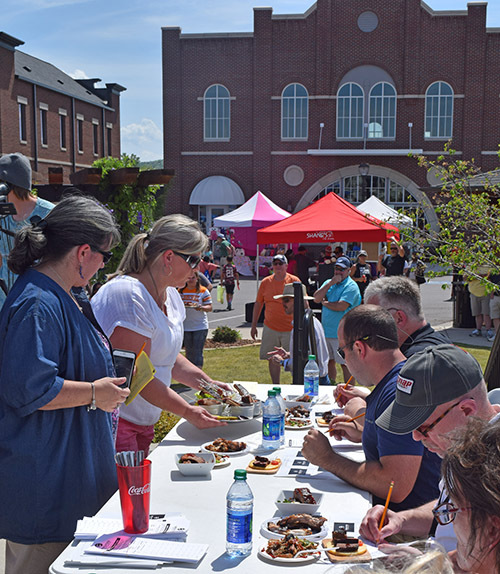 This was a fun local food festival with a welcoming "home town" vibe, but it has implications much bigger than that. As a qualifying round for the World Food Championships, this was like an opening round of the NCAA basketball tournament. For the two winners, this event is the first step toward winning the lion's share of a $300,000 purse. 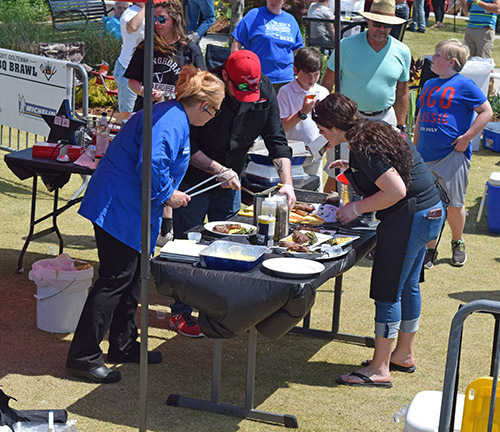 "All they have to do" is win 3 more times at the World Food Championships in Orange Beach, AL this November. 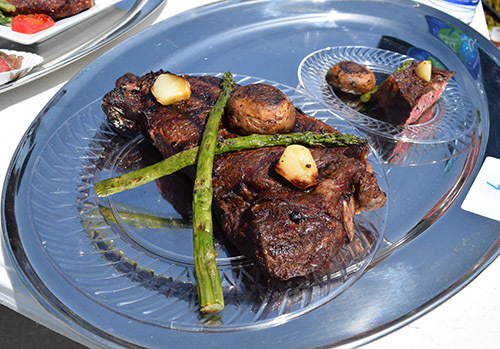 Opening Rounds - Place in the Top 10 for your category (1 of 9) for the Signature Dish and Structured Recipe entries. 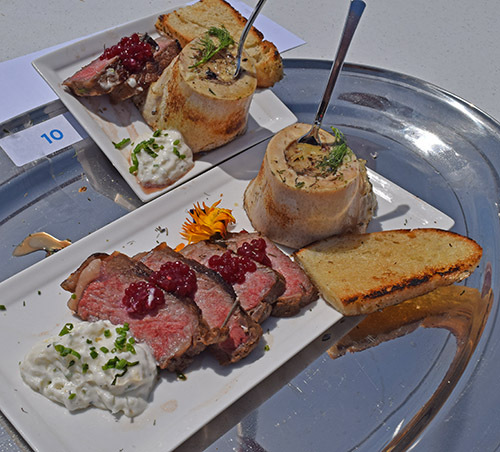 Infursed Round - Create a winning dish based on the category's special ingredient (of course, topping the other Top 10 competitors from your category). Let's check out the fun! 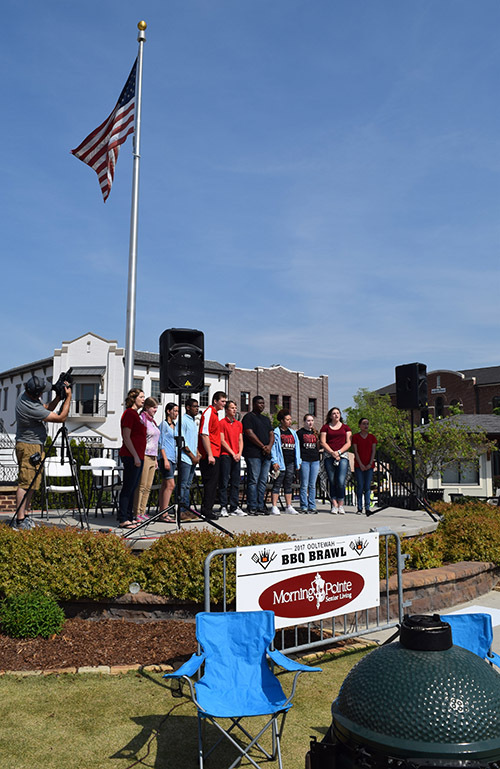 Some members of the Ooltewah High School Choir came out to perform a patriotic medley and our National Anthem. You know the first thing that I like to do is go around and look at the gear people are using. 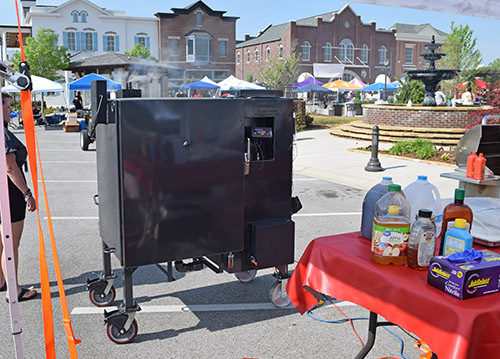 Chef Nick Thiers, a World Food Championships veteran, was using this nice Deep South Smokers. I told him he was super brave to have a white BBQ pit. He laughed and said he cleans it more often then his car. I know that feeling. 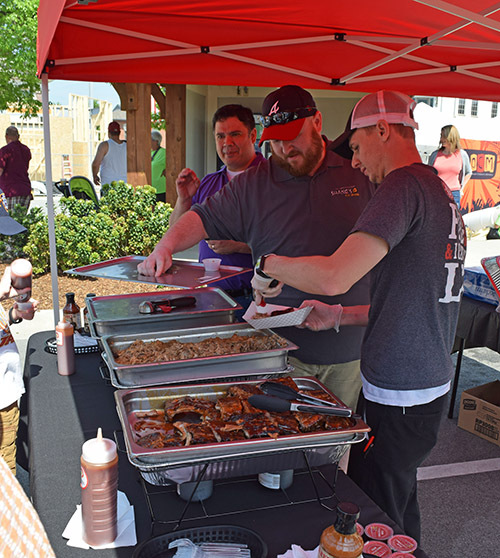 Just like the World Food Championships in Orange Beach, the competitors were a blend of local restaurants, amateur "back yard" teams, and professional competition teams. 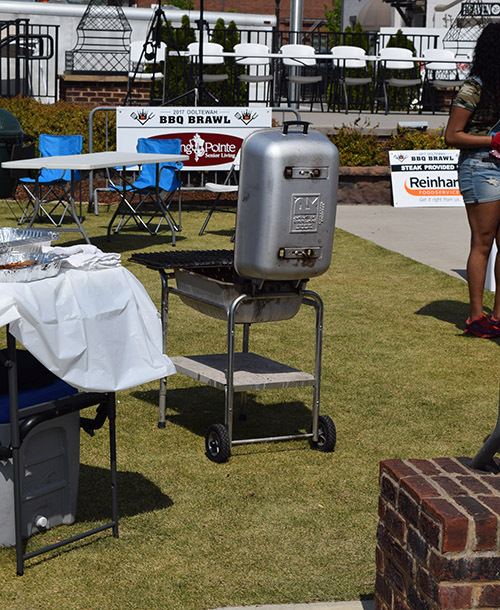 Owls Nest BBQ, a local professional competition team, set up and starting to cook. 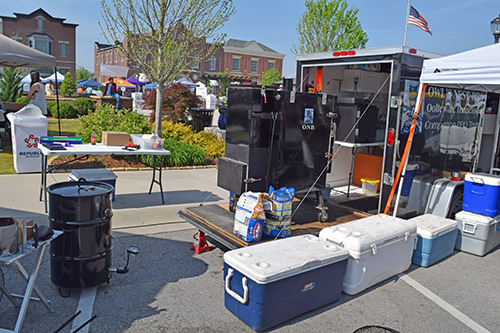 They have a gravity feed cooker (right) and a Pit Barrel Cooker, set up for using a blower/controller (black drum on the left). I really like the idea of a blower on a PBC. These are set it and forget type cookers meant for people new to BBQ and there aren't any settings other than the pre-set air fit at the bottom. Doing this gives you full temperature control of the PBC and expands the possibilities. When one competitor sees something another competitor does and copies it - that's called "shigging". As in "Chris saw Stevie Ray's Pit Barrel Cooker using a blower and he fully plans on shigging this idea when he gets back home." Cute little pig faced offset BBQ pit, maybe a Lang 48? 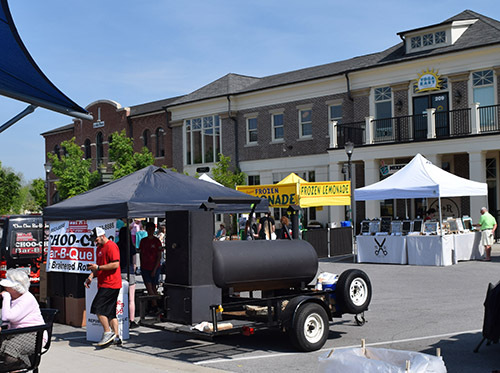 Full Throttle BBQ was there competing on a small residential style offset pit. This is similar to the Brinkmann Smoke n Pit Professional that I first started on. I think it's cool to see teams using backyard equipment going up against the big dogs with their $5,000+ pits. 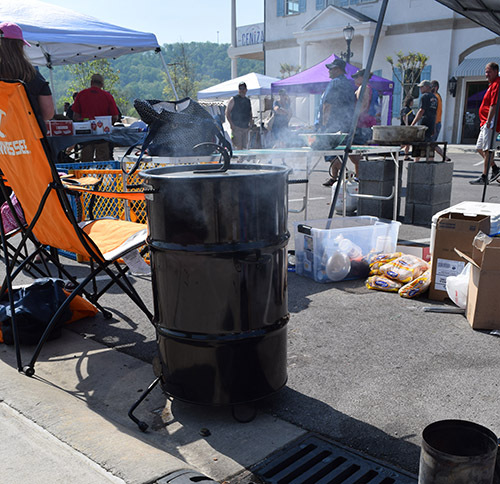 Another Pit Barrel Cooker in use at the contest, this one appeared to be using the original configuration. These are popular units because they are inexpensive, easy to use, and shipped right to your door. 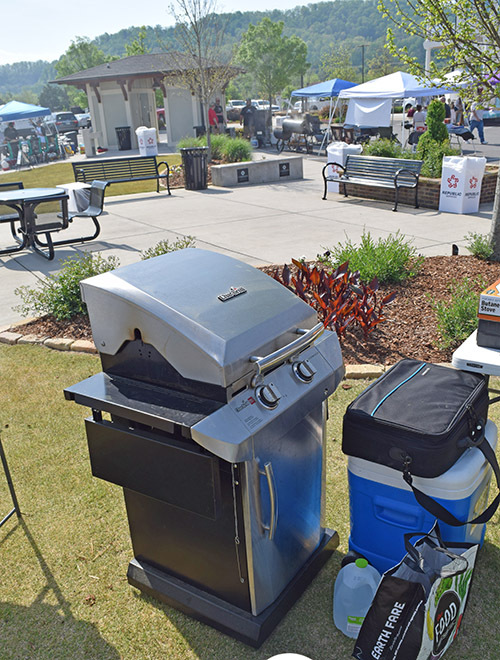 A PK cooker, these grills with a set of GrillGrates are a favorite among the Steak Cook-Off Association teams. Looks simple? It is, simply effective and nearly indestructible from what I hear. 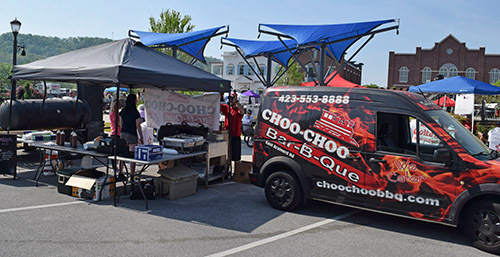 Choo Choo Bar B Que was using a steel offset BBQ pit. They said this pit is for sale so if you're in the Chattanooga area, give them a call if you are interested. I didn't check it out too closely but it looks like a Lang 60 with a warmer box. 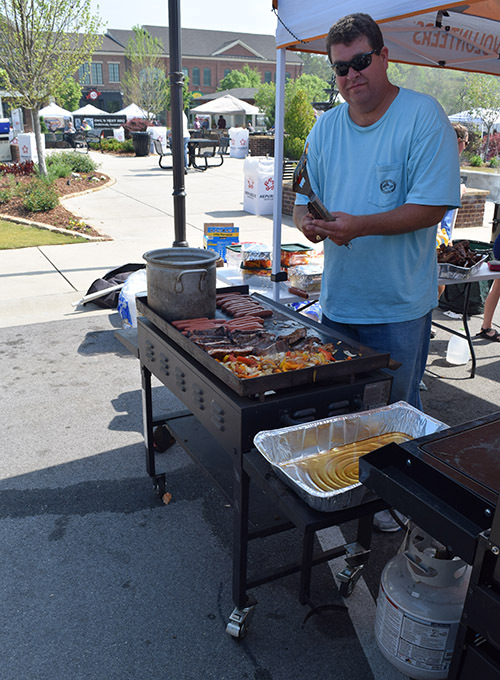 Chef Andi Cagle, another World Food Championships veteran from when they were held in Kissimmee , brought a Char-Broil Performer. 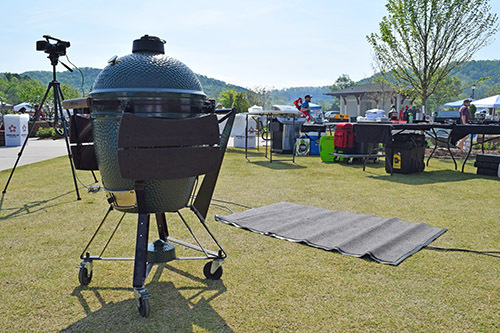 A Large Big Green Egg waiting for his team to arrive. With all the other teams here, he kind of looks like that lonely last kid at school waiting for his mom to come pick him up. 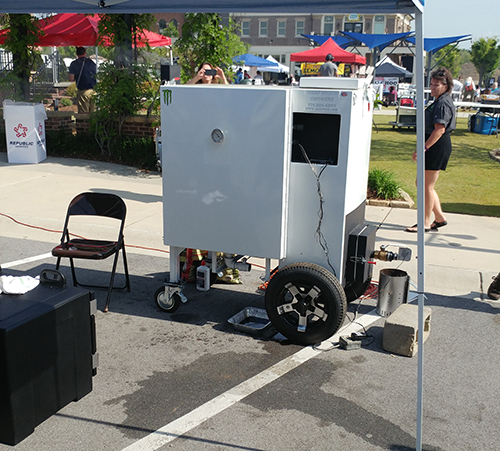 Another Deep South Smokers competing in the event - this one owned by Randall Bowman, the man behind these great smokers and a board member on the Kansas City BBQ Society. I just bought a GC36 from Randall and I can't be happier with its performance. 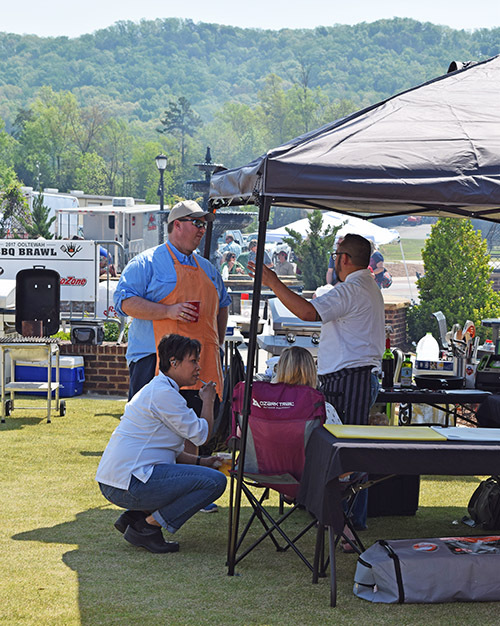 Chef Dao Le had his outdoor kitchen ready to go, professionally organized into stations. We talked about his Anova sous vide and a little bit about his strategy. 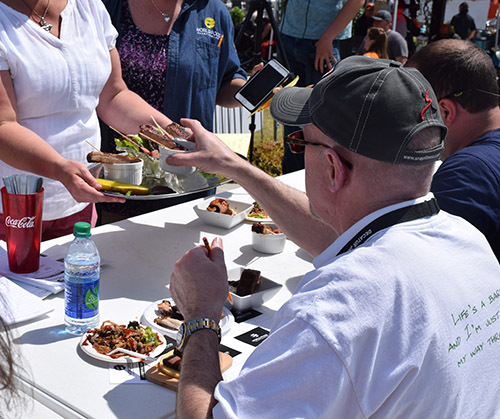 Chef Andi Cagle (bottom left), Chef Dao Le (standing right), and other competitors talk as they wait for the even to start. Finally it was time to "kick the tires and light the fires", the teams got into full production mode. As soon as the smoke rose up, the crowds flowed into Cambridge Square. 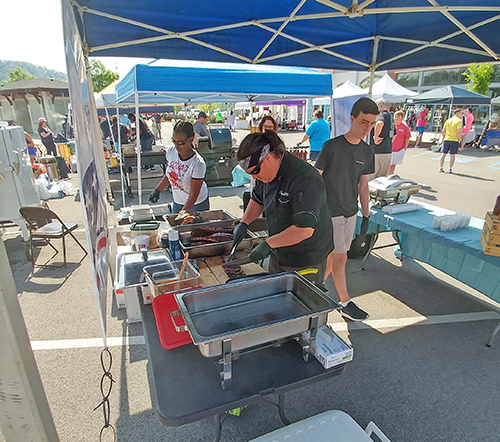 Chef Nick Thiers slicing ribs up to serve the crowds. Nick is no stranger to the World Food Championships as he has been there and won before. It was a glorious Saturday afternoon in East Tennessee. 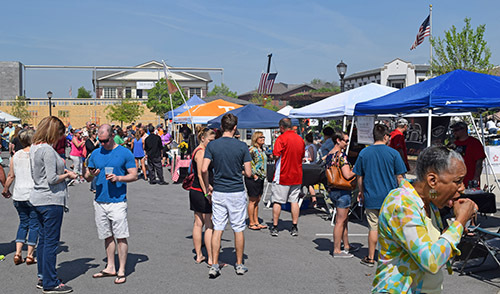 The crowds came and enjoyed the entertainment, food, and shopping local vendors. 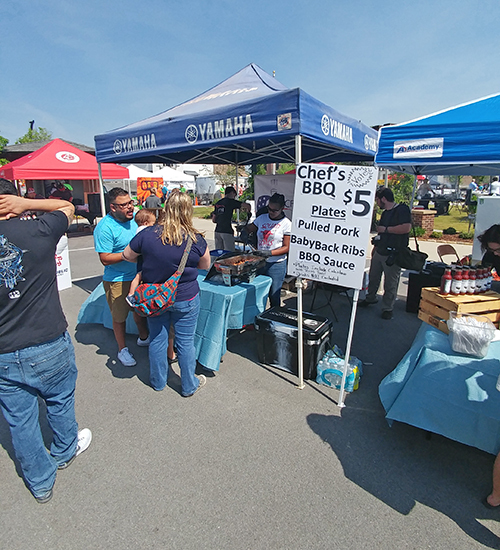 People lining up to enjoy Chef's BBQ. Making good use of a Blackstone Griddle for warming up and cooking food for service. Carefully saucing the food before serving. 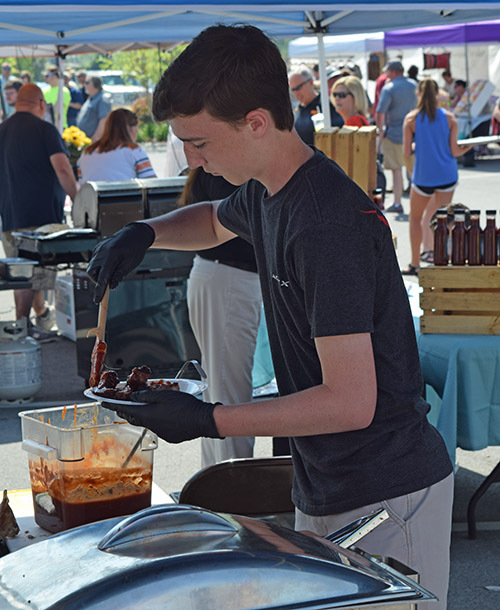 The Ooltewah High Culinary Class had 40 volunteers assisting, I'm not sure if he is one of them but thought I'd mention it. Serving up a little of the ol' low and slow. Handing out samples is a great way to draw attention to your team's booth. Then it was time for Alexis and John to become certified as E.A.T. Food Judges so they could judge the teams. We had a few too many judges because some teams dropped out. 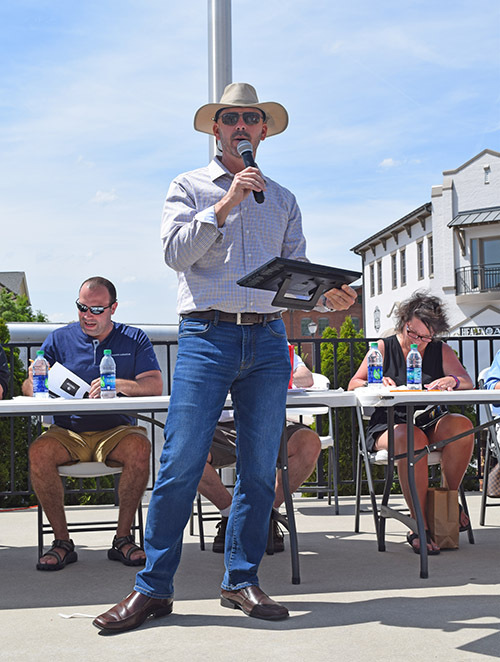 Since I have judged at a World Food Championship event last year, I volunteered to serve as a Table Captain instead. Longhorn's Steakhouse finalizing their turn in dish and samples, under the watchful eye of Leann Pulliam. 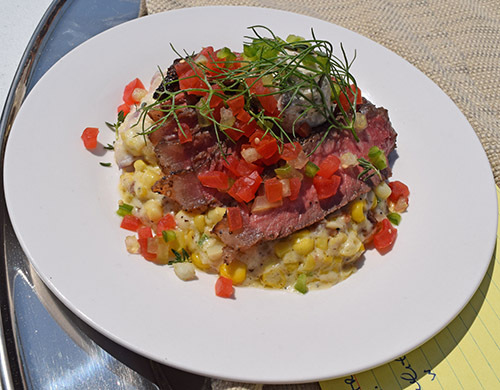 Their entry was a parmesan encrusted NY strip with grilled asparagus and corn. 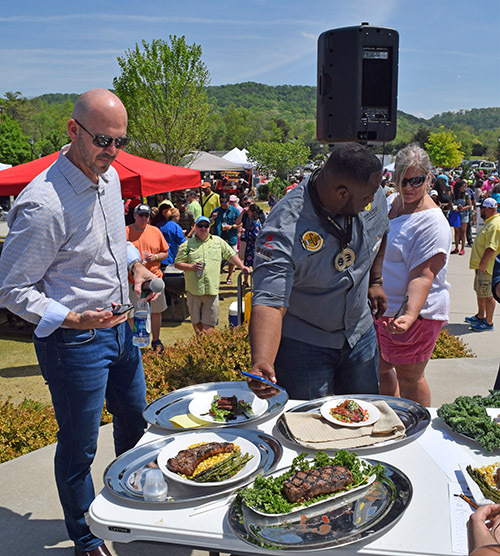 Chef Andi Cagle and her Char-Broil Performer created my favorite dish, appearance-wise (I wasn't getting to taste everything as a Table Captain). Perfectly cooked steak, well composed dish with a lot of color pop. This is one I wish that I had tasted. If memory serves (questionable! 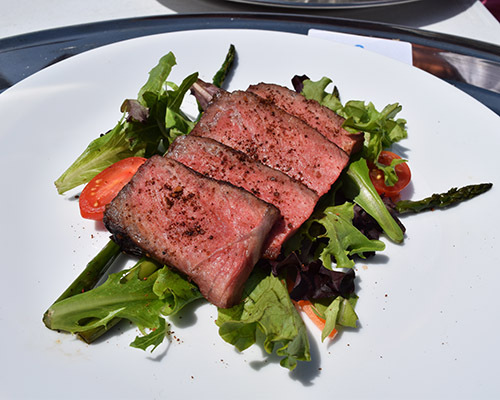 ), this was a cocoa or chile dusted strip steak. I thought they did a nice job on the cooking of the steak. 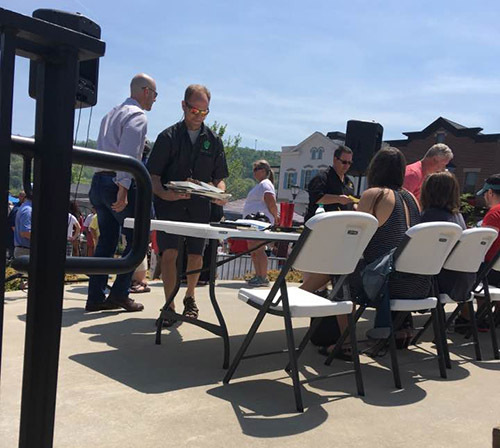 One thing I like about the World Food Championships judging is that food is served to judges immediately as it is turned in, so there's less waiting around which lets the food get cool. As you can see from the clock, the teams still had almost 3 more minutes to get their food in at this point. In KCBS, samples are sent to tables in batches of 6 so if yours is the first sample turned in, it's going to wait until 5 more sample boxes are turned in for judging and they all go to the same table. One of my fellow E.A.T. 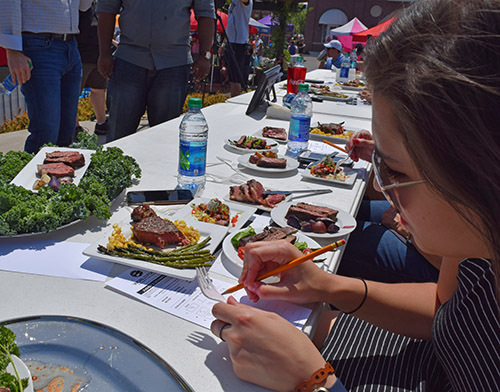 certified food judges writing down the scores for appearance. 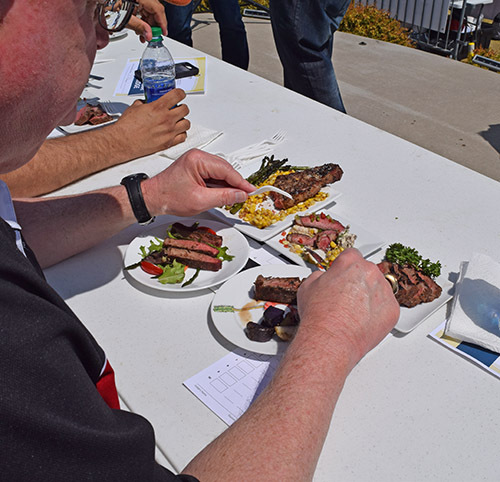 One of the judges tasting the first round of NY strip steaks. There were some very creative entries. 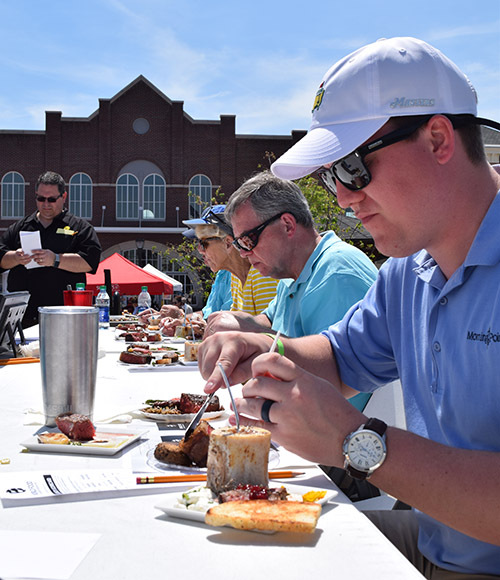 World Food Championship organizer, Mike McCloud (left), and Chef Jernard Wells (right) snapping pictures of the first round of steak entries. 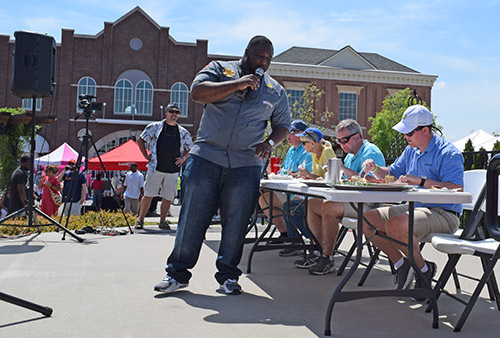 Chef Jernard Wells provides the crowds with a play by play of the judging process and the foods being turn in. Ambitious plating of a NY Strip steak, I thought the bone marrow was an impressive touch. 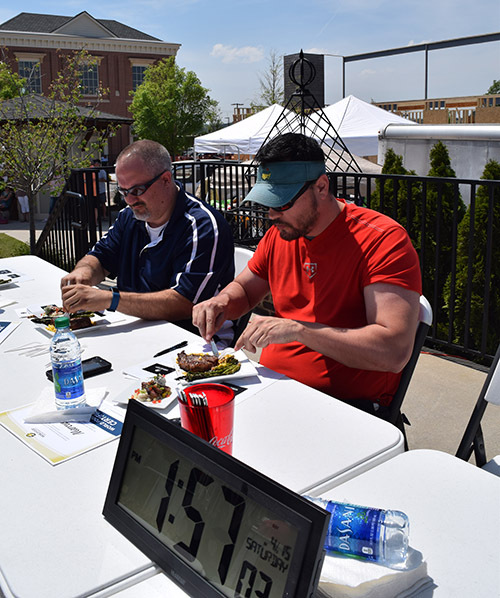 Judging underway for the second round of steaks for the "King of the Cul-De-Sac" contest. I'd love to live on a cul-de-sac that has this many amazing chefs! Steak entry from round two. I didn't get to try this one at all but it looked appetizing to me. 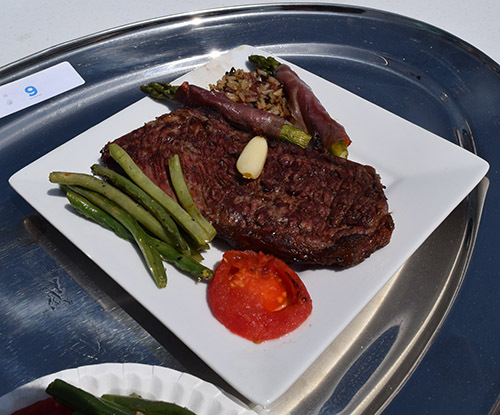 The winning steak was Joe Gora's "Aboriginal Cosmopolitan". 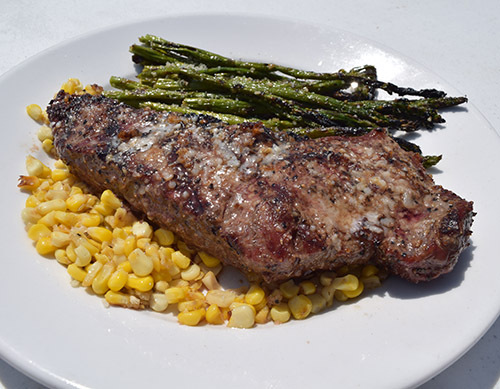 While he had creative sides, Joe let quality speak for itself by seasoning a quality USDA Prime NY strip with clarified butter, salt, and pepper. 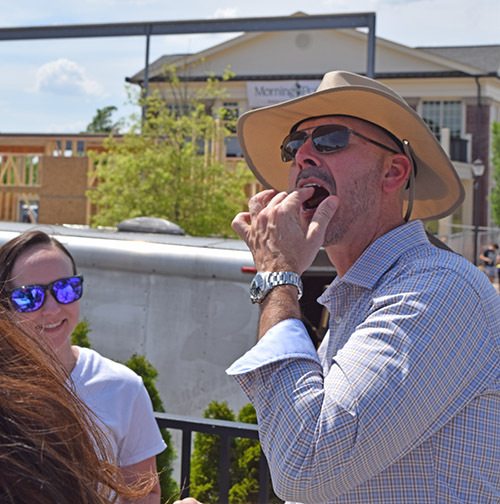 MMA Creative owner and World Food Championship organizer, Mike McCloud, taunts "politely informs" the first round of BBQ teams that they have just a few minutes left to turn in their entries. 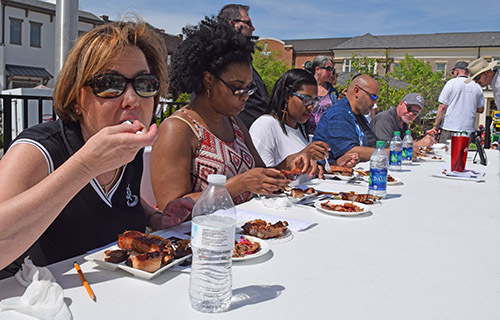 So the cool thing about the BBQ portion of this contest is that it does not require you to turn in specific meats and they are turned in plated on platters. 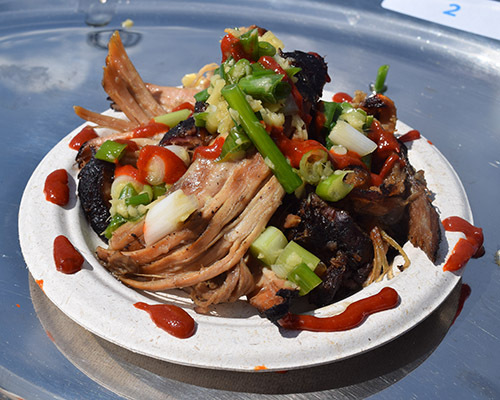 KCBS requires you to turn in chicken, ribs, pork and brisket 30 minutes apart and in white Styrofoam clam-shell boxes. 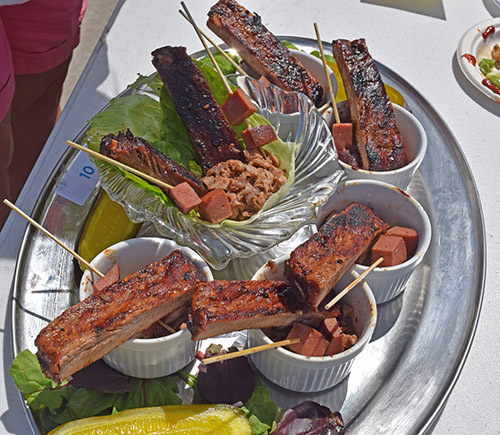 You just turn in ONE BBQ dish and it can be anything BBQ related. This rewards creativity and risk taking. It also let's you call your shot. 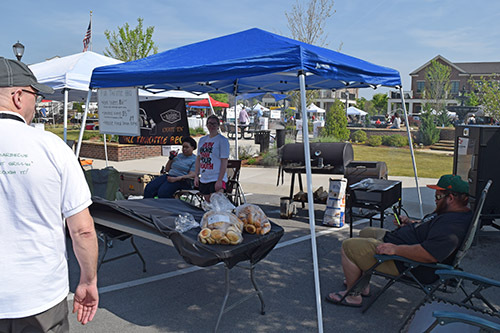 On the other hand, the KCBS method does a better job of testing a pitmaster's skills. So neither style is better or worse, just something different that is nice for a change. John and Alexis both got to judge this Korean style BBQ. It looked a little wild to me but they both mentioned it as one of their favorites of the round they judged. 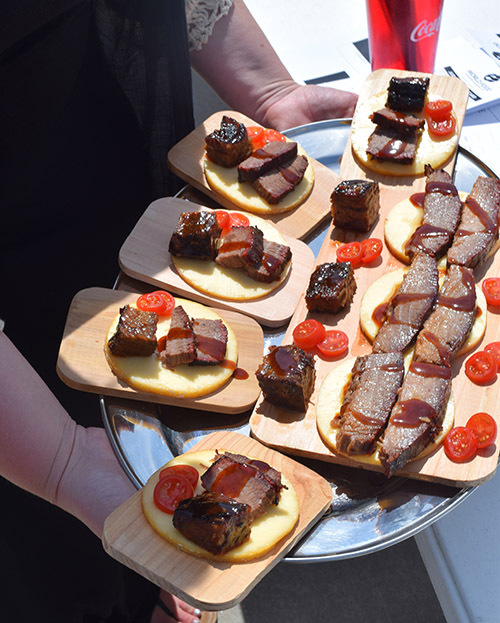 Owls Nest BBQ's brisket, burnt end, award winning sauce, and smoked gouda cheese. I heard this was very good, even better when you eat the brisket with the gouda. Turn in with spare ribs and smoked bologna. Yes, smoked bologna is a thing here in the South, an impressive delicious thing. Table Captain showing a platter for appearance scores only. My teammate, John, selecting his sample from the tray. This team turned in spare ribs and what looked like a bbq pork quesadilla. I love that fun twist, you'd NEVER see that in KCBS comps. I think this one was hickory smoked pork topped with fried onions and an apple slaw. It looked appealing to me but I didn't get to sample this one either. 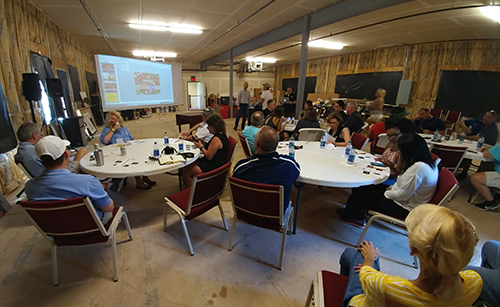 Although most of the food judges were having their first experience after the training, they were quite thoroughly using the E.A.T. method to fairly score the dishes. 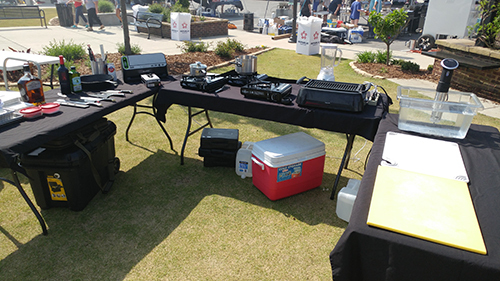 The Table Captain's show the samples, read the descriptions, distribute the samples, and make sure the rules and processes are followed. 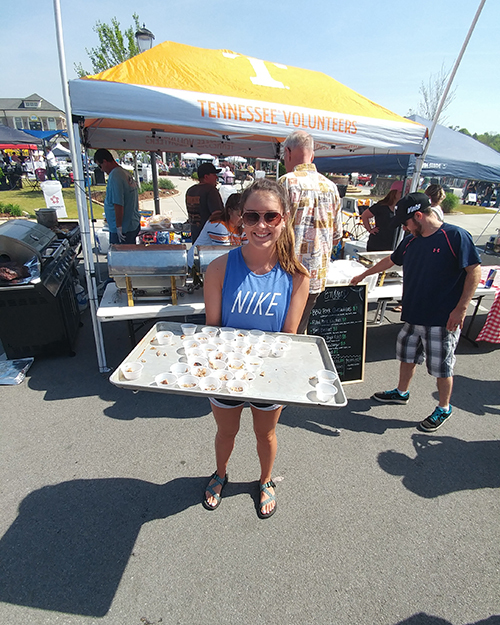 Despite not getting to taste all of the samples, I enjoyed being a Table Captain for the first time. It's all about new experiences, right? 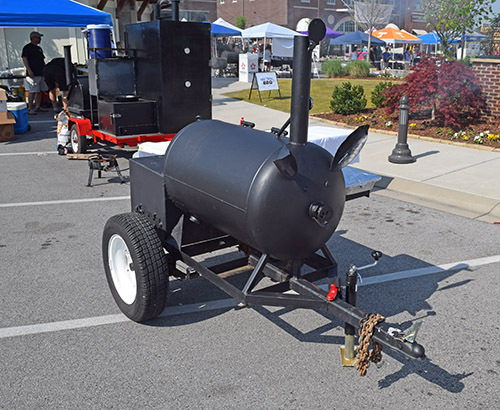 This is the Deep South Smokers entry. Just wow. All they had to do was turn in one thing but they had the confidence in their product and the results showed it. 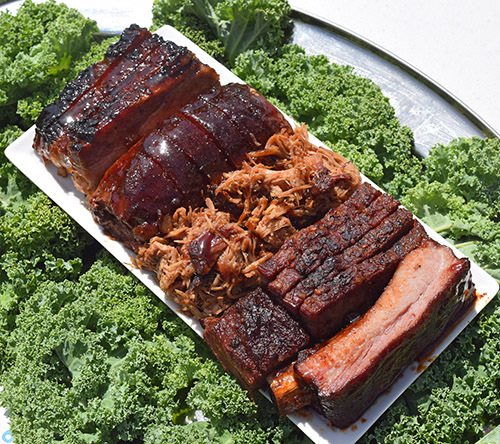 This plate is a pork money muscle, pulled pork, burnt ends, sliced brisket, and a spare rib. What a presentation. They won first place in both People's Choice and Judge's categories. 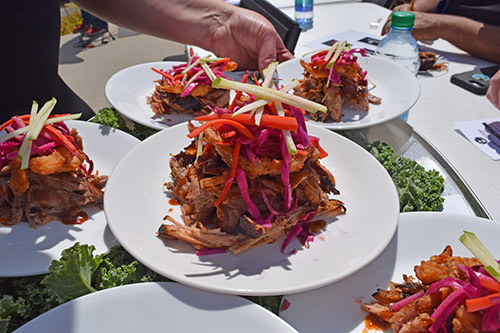 Here are the results of this fun and flavorful food fest. 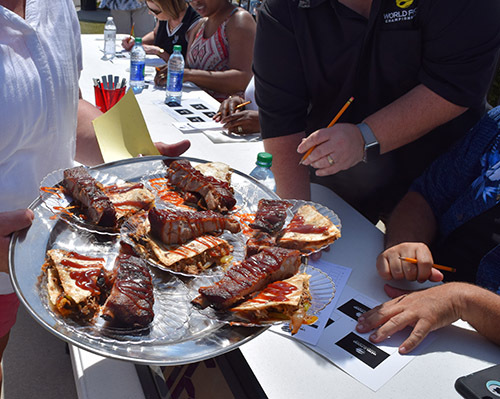 Remember, the winners of the BBQ and Steak cook offs BOTH get a Golden Ticket entry to the 2017 World Food Championships. Congratulations to Deep South Smokers and Joe Gora on their first step towards winning a world title! 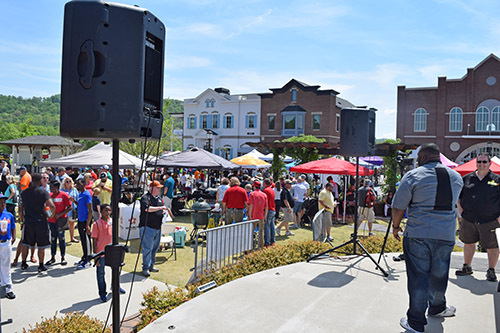 Also congratulations to Ooltewah, Steve Ray, and the World Food Championship organization for putting together such an entertaining and fun filled festival. 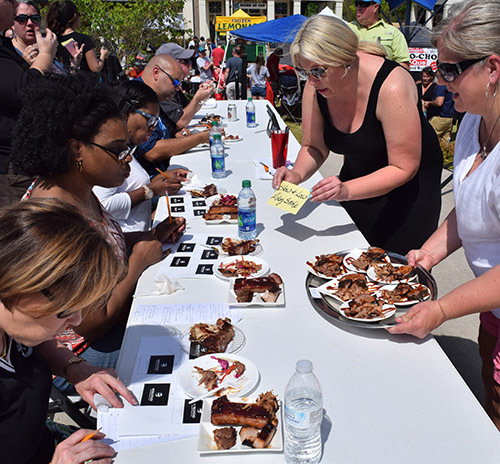 Visit the WFC website to learn more about the World Food Championships, upcoming judges classes, contest events, and of course the The Ultimate Food Fight this November in beautiful Orange Beach, Alabama.